I'm trying not to read into it too much, but I asked Rowan why he drew a mustache on his face with a blue marker and he says, "Ummmm, so I can look like you?" The first time I used my new Sonicare toothbrush, I didn't even bother brushing the whole next day because they still felt clean. I think right after you have a party and you're house is still really clean, that's a great time to haul a bunch of stuff out of your cupboards and make a big "organizing" mess. That's what smart people do. Or not. My socks rarely match eachother, frequently have holes, and are often worn two days in a row. I bought a new One Year Bible . I'm going to start it on March 7th.... that's when Leviticus is over. My husband was painting my guest bathroom at 11 p.m. the night before the baby shower. The next day I got an email from my friend Selina saying "How did the shower go? I certainly hope you didn't paint the day before." Uhhhhh.... who told? While I was at a conference last weekend, my mom gave Rowan a bowl of cereal. He kept telling her it tasted like lemon juice, and she thought he was being silly. After he had eaten the whole bowl she smelled the milk... yep, it definitely tasted like lemon juice. I take my makeup bag with me when I take the big boys to school, and then I sit in the parking lot and put it on. Every day. It's the only time I can concentrate because the littles are literally strapped down. When you hand a preschooler your touch-screen phone to play a game, you really shouldn't be surprised when they return it covered with boogers. You should check for that before you make a call. Grey's class has been collecting food for the food bank and this week we went along on their field trip to deliver it. This is the picture that was printed in the newspaper the next day. Obviously, my boy's no shrinking violet. If you want to play along on 'Fess Up Friday, I'd love to see what you're laughing about this week. Grab a button here and then come leave me a comment with your link! I have a One Year Bible and never considered starting it late!! I may have to join you! My favorite part about giving my touch-screen phone to my son is that I never know what he's going to download. He's always trying to find Angry Bird and ends up with all kidna of wacky stuff! That photo of your kiddos is too much! I love their expressions!!! I really should write down all the things that happen around here every week. You would shake your head in disbelief. Especially the conversation in the car last night. Not so clean with Glenn's two cents thrown in. OMW! I totally laughed about you starting to read your Bible on March 7. I started January 1, but have to admit, I've been skipping a lot of days lately. I feel sacriligous saying I hate any part of God's Word, but uhg...Leviticus. ...and I hate bananas too! Squeeeeee!!!!! 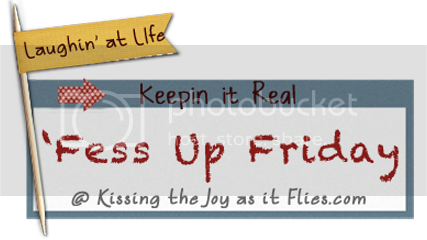 I'm so excited to have an OFFICIAL participant in 'Fess Up Friday, and Amanda, your post made me LAUGH. Really hard. Love it, love it. Kar, you should totally write stuff down as you think of it. Honestly, sometimes between the moment I think of something to five seconds later when I get my file open, I've already forgotten. I really like Evernote (www.evernote.com) for keeping a running tab of stuff for Fridays. That program is great. Angela, I'm so glad to know that I'm not alone in my Leviticus boycott. I've tried to do the "read through in a year" thing in the past but I ALWAYS flake out when we hit that book. Luckily I'm not a type A personality or I'd never be able to skip any parts so I wouldn't even bother. I don't know what I am... type C or D? Love it! The mustache one was among my favorites, oh wait, no it was the toothbrush one cause when we bought our new toothbrushes Trent and I were suddenly grossed out at how poorly we think we have been brushing all our lives, what a difference!! !